We boat testers at PMY like to tout ourselves as professionals, but sometimes it’s awfully hard to leave our emotions at the dock and focus on just the boat—especially if the boat is located in the South of France. 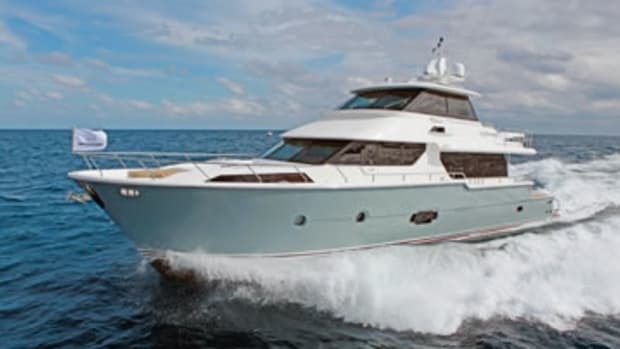 And when she is precisely the type of vessel you’d imagine inhabiting such jet-setty environs—well, it can almost be too much foreign panache for even a seasoned American boat tester to handle. 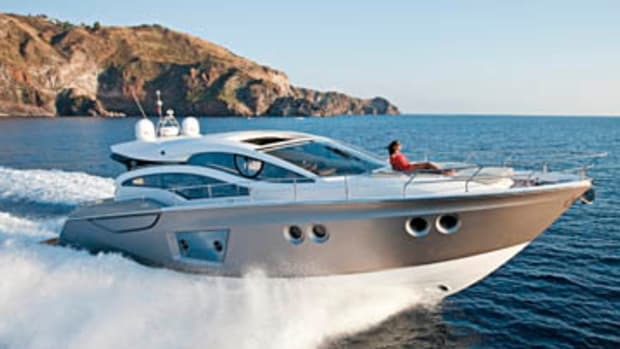 And indeed, the moment I saw the Sessa C68 lying in the marina at St. Rafael, I felt a sense of unreality. 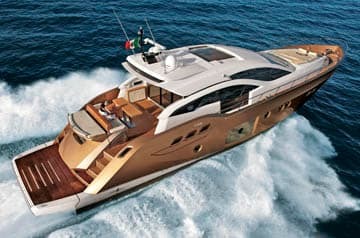 I’d never seen a metallic bronze hull on any boat, not even from other Italian builders who are famous for pushing the envelope when it comes to marine pigmentation. But it wasn’t just the hue that caught my eye. The C68’s hull is one of the most dramatically sculpted shapes I’ve ever seen afloat. With a nearly full-length crease running just above the window line and another crease sweeping up dramatically from the boot stripe, the design flirts with busyness and yet somehow carries it off. Even the three oval ports above each engine air intake, which looked to me like they were borrowed from a mid-’50s Buick Roadmaster, seem to blend in. Completing the sensory assault was a third element: an unusual amount of mirrored glass. Now we all know that the current fashion mode in open-boat design is maximum glass on all four sides of the house. But the Sessa design team of Massimo Radice and Christian Grande has upped the ante by extending the side windows right down to the deck and framing the lower-deck master’s port and starboard opening ports in large rectangles of mirrored glass. The effect is eye-catching from the outside and downright stunning from within. You feel as if you’re on the water. The C68 is a head-turner viewed from any angle, and those of you who seek to garner attention from quayside strollers when you’re docked stern-to will be pleased to know that includes from the stern. A nearly six-foot-deep, teak-clad, hydraulic swim platform makes boarding easy, as do port and starboard stairs that flank an innovative transom seat that converts to a six-foot sunpad. It’s above a garage that can swallow a ten-foot RIB—convenient for sure and very Med. But the engines have to go somewhere, and since these MANs V12s are mated to V-drives, they ended up under that garage. As you might imagine then, engine room access is dismal—a real hands-and-knees affair. And the standard 16-kW Mase genset is consigned to the after bulkhead where I can’t imagine anyone having sufficient motivation to check on it until an alarm goes off. To be sure, this is not a criticism of Sessa but rather of the type. 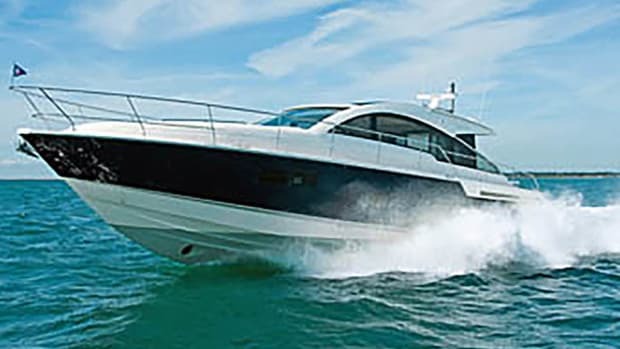 If you want a garage and a roomy midship master, which the C68 has, you have to either accept a cramped engine room or look for a bigger boat. 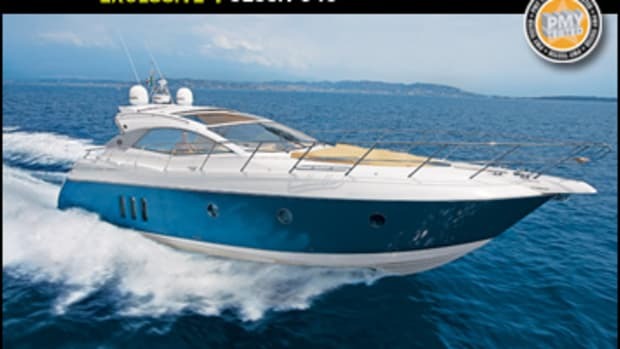 Speaking of “the type,” the C68 is Sessa’s take on a theme that appeared in Italian boatbuilding a couple of years back and is now pretty much universal. Call it “outside in,” the idea being to open as much of the boat to the outside as possible by employing features such as a power sunroof, great expanses of glass on the main deck and in the master stateroom (preferably with sections that open), and a saloon-cockpit door that opens as wide as possible to make the two areas feel like one. It’s a strategy that offers not only pleasing aesthetics but significant structural challenges as well—after all, a greenhouse isn’t noted for its strength. So I resolved to pay special attention to creaks and groans during the performance testing later that day. One crafty way Sessa blurs the line between inside and outside is to place a L-shape bar in the saloon all the way aft where it’s as easy to serve refreshments to those in the cockpit as those in the saloon. Farther in, you begin to feel the impact of all that glass around you—the sensation is as close to being as outside as you can get and still have a roof over your head. A mirrored-glass console forward of the bar on the same side houses the TV; the picture appears magically through the mirror when you turn it on. Moving forward and to starboard you come to the well laid-out helm with two leather chairs. Sightlines are fine but those structural challenges I mentioned rear their head in the form of rather wide mullions in both the windshield and side windows (where one panel on each side opens electrically), all necessary to support all the seemingly unsupported glass. The galley is down and to starboard, and although equipped with lots of appliances, the amount of stainless steel countertop is relatively small. I hesitate to mention this because really, who actually prepares a meal on a boat like this anyway? The important things are a good-size refrigerator and freezer (these are each 5.7 cubic feet) and wine stowage, in this case a flashy 12-bottle vertical rack that should keep you and your guests sated if not soused. Below, the layout is nothing extraordinary—VIP in the forepeak, guest stateroom to port, and full-beam master amidships. What is remarkable are the three heads (instead of two), those master stateroom windows, Sessa’s choice of decor woods and fabrics, thoughtful touches like the curvy teak shower seats, and so much mirrored glass you feel like you’re in a fun house. After the initial shock of this boat’s styling wears off, you begin to notice all sorts of—dare I say it?—practical touches, too. Despite her sleek profile, the C68 has 6&apos;8" headroom or better everywhere. 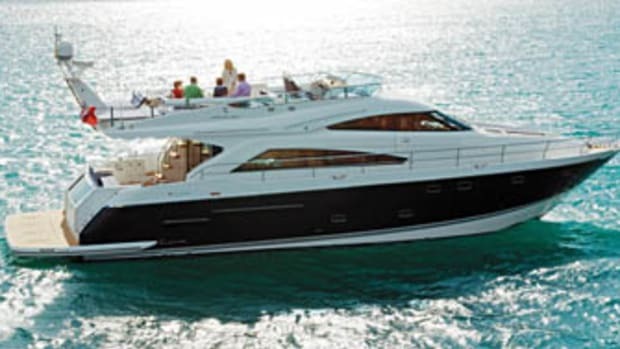 The foredeck has the requisite big sunpad but also has an electrically activated bimini top (optional) for when you’ve had enough solar exposure. And wonder of wonders, despite looking like a boat that screams “toy,” the C68 has foot-wide, teak-covered, bulwark-protected side decks. Indeed getting forward on this boat is a lot easier and safer than on a lot of “passagemakers” I’ve been on lately. And those teak decks? They’re seamed horizontally, not fore-to-aft in the conventional fashion. Why? I don’t know, but I liked it. I also liked driving this boat a lot. 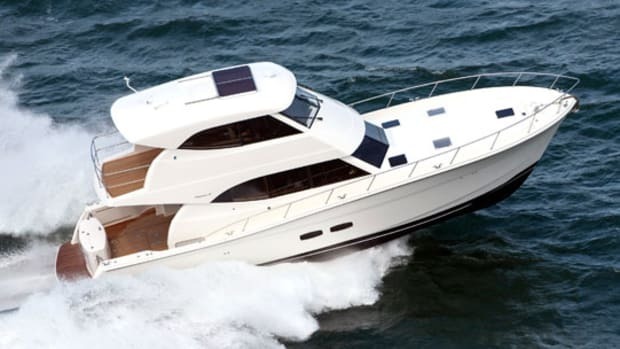 Once I put the image of that engine room out of my mind (it really wasn’t that hard), I began to enjoy the kind of entertainment a well-designed hull and plenty of horsepower can provide. 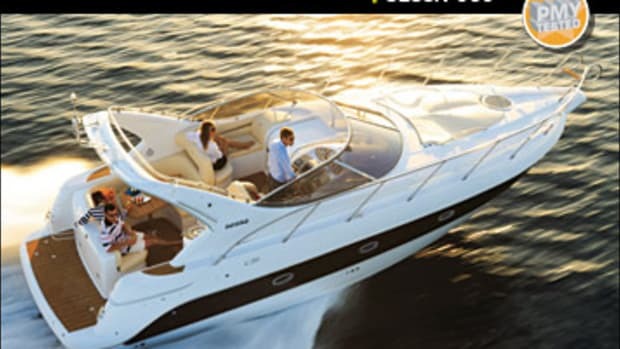 Handling is devoid of glitches, bow rise is moderate (especially for a V-drive boat), and the MAN-ZF combo gives you a wide range of cruising speeds. And no, not a single squeak or groan, although admittedly, seas were dead flat on test day. Truth be told, the C68 is an exercise in indulgence aimed at the unabashed sybarite. But remarkably, it’s not overdone. There’s plenty of good taste and good design here—she feels like a good sea boat. But of course it doesn’t hurt that she turns heads everywhere she goes—even in the South of France. 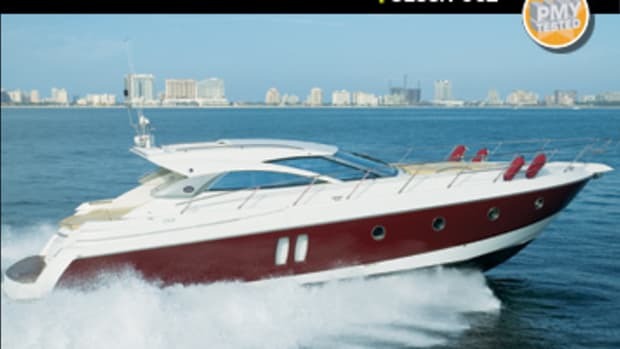 Sessa Marine America (954) 925-1955. 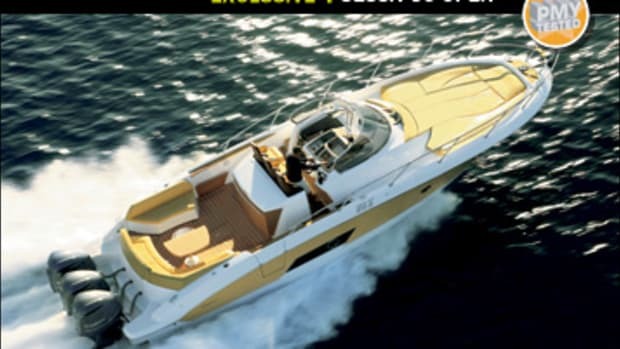 This article originally appeared in the July 2010 issue of Power & Motoryacht magazine.